Today we continued working on our submissions for the Chairman’s Award and Woodie Flowers Award. The team refined our Chairman’s essay to a point where we were comfortable sending it to Amanda Morrison, a FIRST-veteran who has offered her assistance with various submittable awards. After emailing it to her, we focused our efforts on the Chairman’s Executive Summary because it was the least developed of our submission. Our super scout slip was separated into a power up slip and super scout slip. Then, we worked on the individual data entry sheet, where we enter all the data from the scouting slip and perform further calculations, such as % Success of cubes on the scale. From this, we set up our pick-listing sheet, which will order all the teams based on the different traits we are looking for, such as the frequency of climbs (total number of climbs/number of matches). We also set up our summary statistics sheet, which we use to get information for match strategy.  The pick-listing and summary statistics sheet were created using previously set up macros. After outlining our robot’s subsystems’ capabilities we began implementing the subsystems. Electrical started laying out the electrical board. We are simultaneously developing three methods of autonomous: time based, encoder and gyro based, and pure pursuit based. Since last week, we improved on the prototypes and presented them to the team. After the presentation the Officers, Deputies, Mentor, and Captain had a meeting to decide which was the best possible design. After the meeting, we had what we wanted to focus more on and improve. From this meeting we were able to finalize the drive base design from what mechanisms we will use. The practice and competition drive base were cut and painted. They were assembled while the gearboxes were being made. The mock field is coming along and we are almost done. We can’t wait till we bring them in and assemble them. On Saturday we furthered our essays for each submittable award. We finished creating an edited Chairman’s draft to be reviewed by mentors, since our original draft had a copious amount of comments. In addition, we completed an outline for WFA, which we will begin writing the coming week. 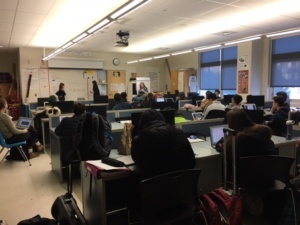 Lastly, we continued editing and completing the Entrepreneurship executive summary by embellishing the content of our responses and meeting with the our Booster Club’s treasurer to create a budget and financial statement. On Tuesday, we created the first draft of our scouting slip. Some things we considered were the number of cubes a team is able to place, when they place them, and how we would measure these things. On Thursday, we worked on editing the scouting slips and created a slip for SUPER SCOUTING!!!!! On the scouting slip, we deleted the power up key and added an area for defense, where we count the number of cubes in the counterswitch. We also added an area for the scouters to draw out the path a robot travels during the autonomous period. The purpose of the super scouting slip is to have one team member watch over the entire field, particularly the power ups and the more subjective observations. In addition, we started the scouting system. After a discussion period to decide the day’s goals, the control systems team split into groups. One group experimented with different sensors for detecting when a cube has been intook into our robot. Another group was implementing TalonSRX Motion Magic on an old robot of ours. 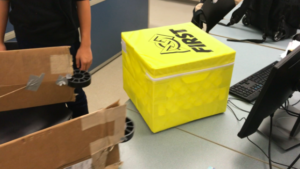 A third group was developing the autonomous framework, and we even unboxed a PixyCam and figured out that, at a minimum, the camera part works. On Thursday, after we finished Need – Want – Wish list, the whole team split up into multiple groups and thought of ideas for scoring on the scale, making sure we have achieved our needs. The students went to present their ideas and started prototyping them. Today we are continuing to prototype and trying to finalize our ideas so we can continue on to make the final product. The design team decided on wheels and started CAD on the drive base. We also began our collaboration with Paul Downs, owner of Paul Downs Cabinetmakers. A few of our members went to his workshop where they began to work on making mock field elements. We discussed the different permutations of autonomous routines. We will make a list of these in the future. Then the programmers split into groups to begin work on everything possible without knowledge of the exact mechanism our robot will have. 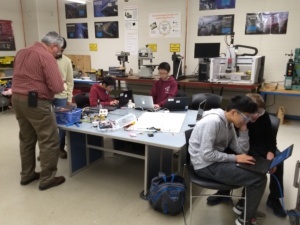 The groups are working on: Implementing Cheesy Drive, creating the autonomous logic framework that will decide which routine to run based on plate colors, using vision to detect power cubes, logging, and a path drawing program for easy creation of autonomous paths to be followed by our pure pursuit algorithm. All of our roboRIOs and radios need to be configured for the new. Electrical started wiring sensors so we can test their ability to detect power cubes in the robot and the lines of tape on the carpet. On Tuesday, the entire team discussed point analysis for the game, including the maximum number of points and the realistic highest score an alliance can receive. 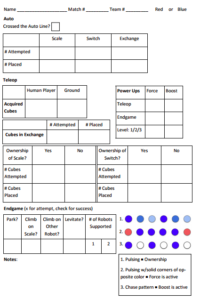 We then discussed the roles that are available for the robot during the game, including the places that robots can receive power cubes. Afterwards, we formed small groups where we described alliance strategies, such as an alliance with a scaler, vaulter, and counter-switcher (defense on the opponent’s switch). After this, we listed out all possible robot actions during autonomous, teleop, and the endgame. Considering all the individual point values for the different roles, we decided on primarily being a scaler. With this in mind, we began to work on our Need/Want/Wish list to prioritize our design goals. Today, we went to Hatboro-Horsham High School to see the game reveal for FIRST Power Up, FIRST’s 2018 competition for FRC. There, we took notes on the videos and rules and studied the wooden mockup structures that Team 708 volunteers and FIRST employees had brought out and developed. Afterwards, we returned to Lower Merion and reviewed the game manual as a team. Following our strategic design process, we created questions about the rules and answered them as we read through the manual. 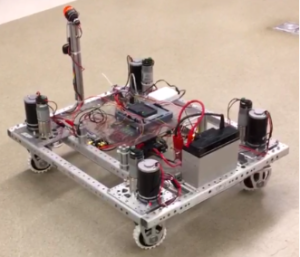 Today was the first test run of our swerve drive! 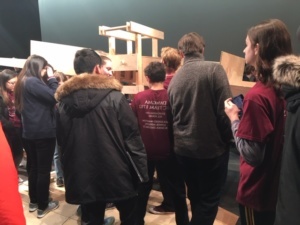 The “Calculate swerve commands to wheel angles and speeds” and “Use PID to set wheel angles, and open-loop the speed” teams finished their code, which was then merged with the “Joystick data to swerve commands” team’s code to make a fully functioning (albeit poorly) swerve drive. We calibrated the absolute encoders that measure wheel angle on our swerve modules. We also fixed an issue where we were telling the wheels to turn to an angle that was outside of their range.